"The creative process for me is varied and yet finite. I have my boards, my paint and my solitude which stimulates me. Painting is a private, intimate and passionate obsession. I feel blessed to have this time to create a piece of art that someone else can enjoy. The mind is not always at peace and the body is not always at rest and yet when I am painting the soul wills itself to transcend. To put shape and form to sunshine, flowers and trees with liquid color and bristle. What a magnificent release from the tides of time where the mind reassigns thoughts and creativity emerges. "Everything that is gathered from years of effort and result, some good and some not so good, is crucial to the process of creation. The rhythm of rising and falling are essential to the flow of my art. How will this piece look, the next...; a question always asked and usually answered. I am not the one to judge, though, the universe will. Why do I paint? This question can only be answered with 'I just know that I have to'. "We all have our work and we all have our play. My inner strength and vision comes from having both simultaneously. "I graduated with a B.F.A. in Painting & Printmaking in 1982 at Virginia Commonwealth University. Since graduating I have worked exclusively as a fine artist, developing a market for my work throughout the United States and abroad. I had become something of a pioneer in contemporary serigraphy and, after more than 15 years of hand-printing, I turned my attention to painting. After exploring silk screen ink as a paint medium, I began to include acrylic, ink washes, oils, pastels and pencils to my repertory. My passion for my craft helps me to stay creative, enthusiastic and energized so that I can hopefully be responsive to new ideas and challenges. "Technically, I was trained both as a painter and a printer, and as such, I've sought to combine the influences of each. When the properties of a painting and graphic are combined, there is an instantaneous and striking contrast. Simplified lines and planes are combined with dramatic gesture of color and free form to give each piece its special visual power. I rely on my imagination for the most part. I may use a reference such as wildflowers, but my work becomes personal interpretations of these images, not scientifically accurate copies. If I can capture the feeling that transcends from an image, the feeling will ultimately last longer than the image itself." "Nature is my primary inspiration. The tides and salt marshes of the Long Island Sound have been an area of contrast for me. Though it provides a sense of permanence, there is always growth and change happening. The sense of energy and freshness completes me, simple marsh grasses swaying skyward toward light. "I create organic textures with my jewelry and my painting. The work is sculptural and emotional, conveying a spirit of Zen-like calmness." "Using an oxi-propane torch, I reticulate, solder, fuse, forge, patina and create organic textures out of molten precious metals. Those textural pieces are then contrasted with contemporary linear forms. I explore a variety of metals and materials with a non-traditional approach to jewelry design. "I strive to create imaginative sculpture that is elegant yet wearable every day. My pieces are soulful reflections of a quiet peace. My message is about protecting the balance and harmony of one's life and projecting positive energy." "With my blowtorch, I developed fusing techniques to create layers. I explore a variety of materials and media. The work starts with acrylic paint washes and ends with oils. Materials such as sterling, fine silver, 22 karat gold and sand are then combined with encaustic medium. I find beauty in the tonality of fire oxidation. I feel the work expands beyond the boundaries of a frame, inspiring a sense of limitless wonder." Gordon Fine Arts celebrates the works of artists David E. Gordon and Sue Brown Gordon. David's work depicts references to nature while his compositions are a marriage between reality and abstraction. Having a gift for color, simplified lines and planes are combined with dramatic texture to create a unique interpretation. His large painted works include such subject matter as vibrant blooming poppy fields and tree forms, reminiscent of a Tuscan landscape with a soft but graphic edge. Ink washes, acrylic, pencil and oil are applied using cloth, wire brushes and hands to board and canvas. Sue Brown Gordon is known both as a jewelry designer and as a painter. 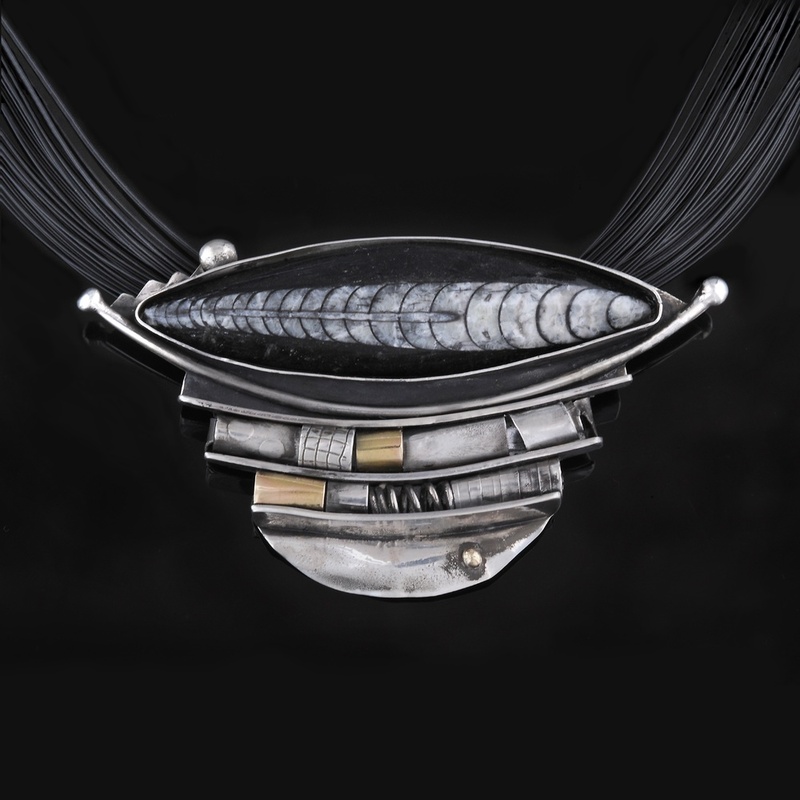 Her sophisticated, contemporary mixed-metal jewelry and paintings are recognizable for their distinctive, organic forms and reflective tranquility. These works are created with a variety of materials - sterling and fine silver, 14 & 18-karat gold and natural artifacts such as fossils, twigs and shells. Each piece is a sculpture, expressive of the artist's personal experience. Please view their works here online and at juried fine art shows. See events for show listings near you.